Bangkok (Thailand) – January 8, 2019 (travelindex.com) – Twenty-two top chefs from five-star hotels in Thailand and Thai Airways International join together to present their culinary talents creating superb menus using the best quality imported products and pesticide-free vegetables from ‘Jan-Ka-Pak’, Camellia Seed Oil from ‘PatPat’, and ‘coffee’ and the ‘Pagakayaw shawl’ (for auction) from Phufa Shop, all of which are projects initiated by Her Royal Highness Princess Maha Chakri Sirindhorn. In its 10th edition, the 2019 Bangkok Chefs Charity Fundraising Gala Dinner, organized annually by Gourmet One Food Services (Thailand) Co. Ltd., Thailand’s leading importer of premium food products, to raise funds for underprivileged children in the remote areas of Thailand, will be staged on Monday, 4 February 2019 in the Royal Ballroom of Mandarin Oriental, Bangkok. 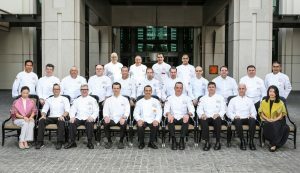 The 22 foremost chefs from leading hotels in Thailand and Thai Airways International will craft an 11-course gourmet menu using imported premium products such as Foie Gras, Wagyu Beef, Lobsters, Baby Lamb and more alongside pesticide-free vegetables from ‘Jan-Ka-Pak’ and Camellia Seed Oil from ‘PatPat’, two royally-initiated agricultural development projects under the Chaipattana Foundation at Chakrabandh Pensiri Center for Plant Development at Tambon Pongpha, Mae Sai District, Chiang Rai Province, as well as coffee from Phufa, The Occupation Promotion Project of Her Royal Highness Princess Maha Chakri Sirindhorn. “We are once again highlighting Camellia Seed Oil from ‘PatPat’ and pesticide-free vegetables from ‘Jan-Ka-Pak’ as ingredients in the creation of this year’s menu in order to continue to let the public be aware about the many benefits of these high-quality products of Chaipattana Foundation in Chiang Rai which has carried out extensive agricultural development projects in order to ensure sustainable benefits for all communities,” said Ms. Nuntiya Hame-ung-gull, Managing Director of Gourmet One. “This is in line with the Bangkok Chefs Charity’s concept – to serve the ultimate gourmet creation of the country’s 22 leading culinary gurus featuring premium, imported products in combination with health-promoting ingredients such as Camellia Seed Oil and pesticide-free vegetables in support of long-term sustainability,” added Ms. Nuntiya. This year, apart from the participation of 11 aspiring “Young Chefs” each of whom will partner with two chefs to learn and help in the creation of each dish from the 11-course epicurean menu, adding more fun and colour to the 2019 charity event will be a fashion show by children of society’s prominent personalities featuring the “Pagakayaw” shawl from ‘Phufa Shop’, the Occupation Promotion Project of Her Royal Highness Princess Maha Chakri Sirindhorn. The folk “Pagakayaw” products showcased on the catwalk will be part of the evening’s auction as well. The highlight fund-raising segment of the Bangkok Chefs Charity is none other than the opportunity for dinner guests/philanthropists to make donations; and in return for their generosity, the highest bidders will be presented with a formal gourmet dinner cooked by their preferred chefs at the bidder’s residence or venue of choice. All funds raised during the course of the evening as well as auction of Phufa’s ‘Pagakayaw’ products and ticket sales, without any deductions for expenses, will be presented to Her Royal Highness Princess Maha Chakri Sirindhorn to benefit the Royal Patrol Police schools. Since the inaugural Bangkok Chefs Charity which took place in 2009, proceeds amounting to 132.66 million baht, derived from ticket sales and funds raised during each event from the past nine editions, have benefitted the Royal Patrol Police schools under the Patronage of Her Royal Highness, and provided scholarships for needy children as well as contributed towards purchase of teaching and learning materials and sports equipment. At the 2018 Bangkok Chefs Charity Fundraiser, a total of 32.8 million baht was collected from the fund-raising session and ticket sales. The highest donation of 11.8 million baht was made by Mr. Prayudh and Suvimol Mahagitsiri. Mr. Anant and Piyanuch Raweesaengsun donated 10 million baht. The organizer presented all proceeds (without deductions for expenses) to Her Royal Highness Princess Maha Chakri Sirindhorn to help needy schoolchildren in remote areas of Thailand; and to go towards the construction of the “Bangkok Chefs Charity Border Patrol Police School” at Ban Mae Khor, Mae Charm District, Chiangmai Province in order to provide full educational services to poor children in remote areas. The 2019 Bangkok Chefs Charity Fundraising Gala Dinner, to be once again graciously presided over by Her Royal Highness Princess Maha Chakri Sirindhorn, will take place on Monday, 4 February 2019 at 17.00 hrs. in the Royal Ballroom of Mandarin Oriental, Bangkok. Apart from the 11-course gourmet menu using ingredients from Chaipattana Foundation and premium imported products, the 2019 Bangkok Chefs Charity Fundraising Gala Dinner is also supported by Central Wine Cellar. For those who are interested to join the 2019 Bangkok Chefs Charity Fundraising Gala Dinner, tickets are @Baht 12,500 per seat (10 seats per table). For reservations or more information, please contact Gourmet One Food Services (Thailand) Co., Ltd., tel. 02 403 3388, ext. 108 or call 091-837-5555 Line:@gourmetone or contact Khun Rachanee, F&B Department, Mandarin Oriental, Bangkok, tel. 02 659 0302 or 02 659 9000, ext. “F&B”. Pesticide-free vegetables come from Jan-Ka-Pak’s agricultural plots at Chakrabandh Pensiri Center for Plant Development at Tambon Pongpha, Mae Sai District, Chiang Rai Province. ‘Jan-Ka-Pak’ is the reverse of ‘Chakrabandh’, the name of His Highness Prince Chakrabandh Pensiri, scholar and agricultural practitioner. ‘Jan-Ka-Pak’ was set up by Her Royal Highness Princess Maha Chakri Sirindhorn, who later designated the Chaipattana and Mae Fah Luang foundations to establish the Chakrabandh Pensiri Center for Plant Development in commemoration of the 100th Birthday Anniversary of His Highness Prince Chakrabandh Pensiri. The Center’s objective is to improve and develop plant varieties for farmers and agriculturalists. Her Royal Highness Princess Maha Chakri Sirindhorn, through her many overseas visits, has brought back high quality seeds and given to the Center for further experiment and development. Pesticide-free vegetables produced from one of these seeds has once again made its way into the menu of the 2019 Bangkok Chefs Charity. Benefits: Good for health, has a high boiling point (252 degrees centigrade) suitable for all types of cooking and food preparations. The oil has a high level of unsaturated fats (good cholesterol), which helps reduce cholesterol when compared with other types of oil in the market. It can prevent paralysis, cardiovascular disease, high-blood pressure and diabetes. Camellia Seed Oil also contains Omega-3 (0.3%), Omega-6 (9.2%) and Omega-9 (77.7%). Established in 1995 as a distribution channel for the products from the Occupational Incentive Project initiative of Her Royal Highness Princess Maha Chakri Sirindhorn to provide support for the poor people living in remote rural areas to have additional occupation to increase their income from agricultural activities in order to raise their living quality. The “Pagakayaw” shawl is one of the outstanding folk art products on sale at Phufa Shops. www.phufa.org.